As many of you know, one of my dearest friends was killed tragically in a car accident on April 27th and her son has been recuperating from his injuries. I am so happy to say that he is doing FAN-tabulous and he is one of the strongest people I know. His recovery has been truly miraculous. Watching his strength and seeing him smile makes me feel close to my friend. She lives on in him. After the inital shock wore off and her son was released from the hospital and sent home to recover, plans for the funeral ensued. I spent the greater part of last week putting together a "movie" filled with wonderful memories of my friend with her family, her son, her husband & her friends. It was emotionally draining but something I felt very honored to do. Services to say "good-bye" or as I like to think, "See You Again", were held on Thursday & Friday. I honestly didn't think I had another drop of sadness in me but it is amazing how the Church always wraps itself around me and I loose myself in whatever emotion I may be feeling at any given time. Having Daddy Dave there beside me as my rock saved me from becoming totally hysterical. Saturday was a day of numbness. Laziness. Maybe even a little reflection. BUT yesterday, for the first time in over two weeks I was able to smile and REALLY feel happy. It's like something or someone swept down and lifted a million pounds of sadness and grief off my heart. 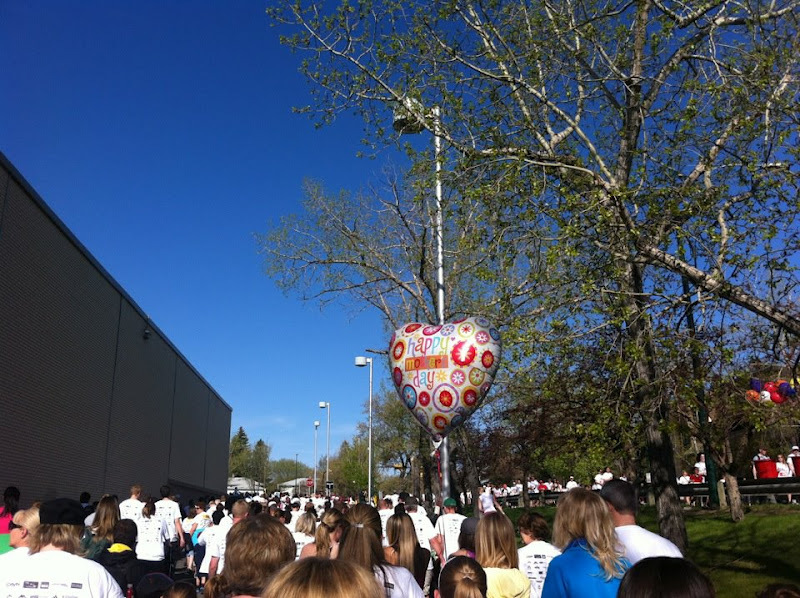 For the past 7 years, Rhonda and Calvin would participate in the Mother's Day Walk here in Calgary. For 7 years my friend tried to get me to walk with her...I always declined. First giving her excuse like "Oh, I'd love too but I'm busy that day" to flat our telling her "Ya. No. That doesn't sound like a fun way to spend Mother's Day." *sigh* Another life lesson I have had to learn the hard way...never put off today what you may not get that chance to do tommorrow. I ALWAYS gave a generous donation to make up for my guilt though. LOL. 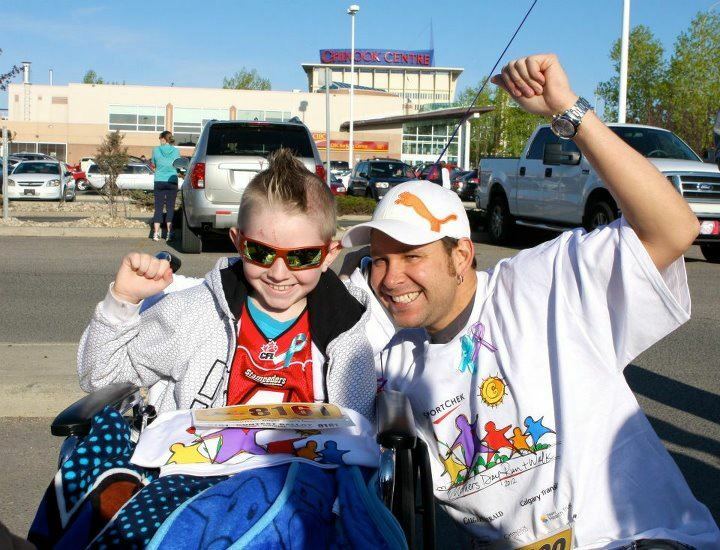 This year, with the help of family, friends & strangers Calvin raised $8881.00 and earned himself some SWEET SWAG & PRIZES! You can't even begin to imagine the reach this story has had. Lego Inc. decided to send a "Surprise Lego Package" because they got wind that he was "disappointed" he wouldn't get the mall gift certificate (worth $100) so he could buy more Lego but instead he would be "forced" to spend the weekend in a fancy hotel in the mountains (worth OVER $500) because he had raised so much cash. LMAO! In honor of my friend's commitment we put together a a team called "Walking to Remember Rhonda" and we participated in the 5km walk on Sunday with her son Calvin, his dad, Rhonda's family and so many of her friends. The positive energy was truly amazing. I honestly felt the presence of Rhonda there, lifting our grief and giving us permission to "walk on" in life for her, her son...for us. She wouldn't want the people she loved to live under a cloud of pain & sadness. She would want us to see the rainbow after the storm and help keep her memory alive through our many stories of happiness, joy and laughter. I plan to do just that. This is only a FEW of the Team members who came out to walk for Calvin & Rhonda. YUP! That's Ave & Bryce...we were up at 6:30 and out the door by 7am to beat the crowds! Calvin & Dad! He carried his mom's t-shirt & number throughout the race. 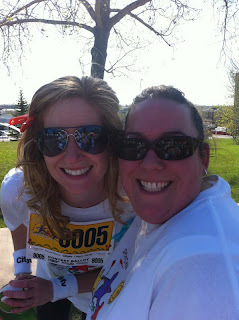 The Mayor of Calgary was set to meet Calvin before the race but we weren't sure where to meet him. I actually found him in a crowd of 14,000 people. Can you believe it? Ya, me neither. Thanks Rhonda! With over 14,000 people participating in the Mother's day Walk & Run it was a good thing that I bought this Balloon to tie to Calvin's wheelchair so we could always find the "TEAM"! LOL! Same Time. Same Place. Same Reason. Next Year! The kids LOVE "Bubble Land"
I Hope Everyone Had as WONDERFUL of a Mother's Day as I Did! awesome blog, glad the walk went well and that Calvin raised so much in Rhonda's honor. you gotta tell me more about that bubble machine, my boys love bubbles! Such joy out of tragedy. Keep those memories close Ginger. My eyes are wet after reading this post. I'm so glad you had such a great Mother's Day...it's one you'll never forget, I know. Continued hugs to you, Ginger!